Koi fish is a type of goldfish with beautiful patterns and colors throughout the body. This fish comes from Japan that used to be used as fish consumption but now more often kept as ornamental fish. Common colors contained in koi fish body usually are red, blue, orange, white, yellow and also cream with different size and body pattern different. For the type of koi fish itself is also very much like kohaku with red and white, showa sanshoku with a combination of red and white and black, tancho with white base color and red spheres on the head, shanke taisho with white base color combination black red, hi utsuri with black base color and red or orange combination, shiro utsuri with a combination of white and black color and many other types of koi fish. Like other types of ornamental fish, in the way of keeping koi fish are also often affected if not treated properly. In this review, we will review the treatment of diseases in the most common koi fish you can do at home. Mushroom disease is a common disease of ornamental fish or fish consumption caused by dirty pool conditions, erratic weather or because the pool temperature is too high and feeding too much. Gill stem fungus disease is seen from the incidence of white patches in the area of the mouth and then can spread throughout the body that if not treated immediately then it can spread to the gills and then rot and die. 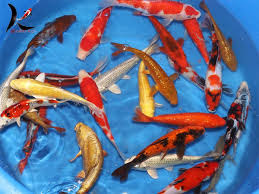 To overcome the diseases of koi fish and also diseases on other types of freshwater ornamental fish species, there can soak koi fish in a solution of 10 liters of water with 0.1 green F and also 1 teaspoon of aureomycin. Add the sick fish and let stand for 10 to 15 minutes and will heal within a few days. The second koi fish disease that occurs due to aeromonas bacteria is a dangerous disease with symptoms such as red skin, bulging belly and also the fin and gills that cause red spots that are also common in the cultivation of betta fish. If not addressed immediately, these bacteria can make the body part of the injured fish decayed due to the condition of water that is not treated and dirty. To overcome this disease, mix phenoxyethanol nitrofurazon or chloramine with koi fish food using a dose of 1 gram per kg of fish feed. Scratch lesions in koi fish are a type of non-parasitic disease caused by the aggressive movement of the koi fish makes its body often crash and cause injury. If not treated immediately, then not the body part of koi fish that can be injured but also can make harmful bacteria such as protozoa or mushroom into the body of koi fish through the wound. How to overcome the scratch on the koi fish is easy enough soak the koi fish in monafuracin solution about 4 to 5 days on a regular basis. White spot disease in koi fish can also occur in other types of fish such as betta fish, arowana fish, how to maintain catfish and other types of fish commonly referred to as ich disease. Koi fish affected by white spot disease will be seen from the incidence of white patches on the body that if viewed at a glance looks like a fungus although the two types of diseases is very different. To overcome the white spot on koi fish can be done using salt kitchen. Prepare 10 to 15 grams of NaCA per liter of water and insert the sick koi fish in the solution for 15 minutes. Do this way as much as 3 to 4 times a day until the koi fish really healed. Symptoms of this disease can be preceded by itchy itching that makes koi fish often rubbing his body on rough objects inside the pond caused due to the type of parasite gyrodactyius sp. To overcome the skin worms disease koi fish can be done by soaking koi fish in a solution of 10 liters of water anti parasite about 10 minutes. Diseases dropsy make scales koi fish will peel and also swelling koi fish body so it is difficult to breathe and move that can lead to dead koi fish if not immediately overcome which is also one of the diseases in betta fish. To overcome the disease dropsy in koi fish can be done by giving an anti-bacterial solution and also sprinkle a little salt on the body koi fish are sick. In addition, add also oxygen acids in the fish feed to accelerate the process of curing dropsy disease. Parasite smallpox that attacks koi fish is quite dangerous and can make koi fish stress which is also a disease in catfish. The disease caused by this virus will make white spots visible on the body as well as slimy with a milky white color that will turn red rather gray when not immediately cured. Actually this disease can heal by itself, but to speed up the healing process is done by giving the disinfectant drugs dissolved in koi fish pond. Koi fish disease caused by parasitic worm anchors can occur by sucking the body fluids that make koi fish become thin and limp and can be transmitted to other koi fish if not immediately overcome. If the amount is still small, then can use tool tweezers. But if it is uniform and quite a lot, then it is better to use formalin. Enter the koi fish in a bucket filled with water solution and fomalin dose 25 ppm. Do this regularly about 2 to 3 times for 10 minutes. Generally koi fish affected by the disease can be recovered by making changes to the water as in the way of cattle fish mujair. Maintaining water quality is very important to be done so that fish is not stress and can live healthy. To check the water quality, you can buy a device to test water at the pet store to recognize water problems such as excessively high levels of ammonia. Make sure the water temperature stays between 10 and 25 degrees Celsius. Test also the acidity level of water because koi fish can generally live with a neutral pH of about 7. If water is too acidic, then you can buy chemical neutralizer in the pet store. While to check the last water quality can be done by testing oxygen to ensure if the absorption exceeds 70%. Some koi fish often suffer from untreatable bladder problems just by replacing the pool water including in koi betta fish cultivation. Feeding vegetables like frozen peas and low-fat foods can be very helpful for treating bladder disturbances in koi fish. Frozen peas are the right choice because they are rich in fiber and can sink at the bottom of the pool so that koi fish do not have to look for food to the surface. However, do not feed too much on the sick koi fish and only if the feed is gone. If the feed is given too much, then there will be the problem of ammonia in the pond and make koi fish getting sick. Small organs in koi fish can swell which then suppress the bubbles of the pool resulting in frequent dysfunction in how to keep koi fish in concrete ponds. Stomach, intestines and liver are some koi organs that are susceptible to swelling due to poor eating patterns, eating too much air when eating, consuming low-quality feed, growing cysts that make the kidneys swell and also defective in internal organs. To overcome swimming bubble disease in koi fish can be done by increasing the temperature in the pool where the water temperature is too cold can inhibit digestion and make koi constipation fish. In addition, satisfied also koi fish for 3 days so that some organs in the body of koi fish swelling can recover. To prevent the death of koi fish due to disease and also how to keep the fish in the aquarium so as not to die, it can be done by providing a varied diet as well as balanced. Do not give too much koi fish to eat so as not to make fish more pain as well as pollute the pool water. In addition to providing pellets, you can also combine koi fish feed with silk worms, peas, saltwater shrimp and blood worms. The last way that can be done as a disease treatment in koi fish is to bring the fish to the veterinarian. Sick koi fish can not always be cured with home remedies and should be checked by a veterinarian. The doctor will know exactly what causes your koi fish pain then give the best treatment. Terima kasih telah membaca artikel tentang Top 13 Disease Treatment On Koi Fish- BluelotusDc di blog Best Coloring Pages For Kids jika anda ingin menyebar luaskan artikel ini di mohon untuk mencantumkan link sebagai Sumbernya, dan bila artikel ini bermanfaat silakan bookmark halaman ini diwebbroswer anda, dengan cara menekan Ctrl + D pada tombol keyboard anda.